After using an electric caddy I will not go back to hauling my own bags around the course. If I play 5 hours of golf a week I usually spend one of those hours fumbling with my bags when I could be doing more important things. A buddy of mine started using an electric caddy and I had to get one for myself once I saw it in action. It was carrying all of his bags with ease while I was huffing and puffing up the fairway. The brand he was using was a Spin It and after seeing how it worked for him, that was the brand I decided to go with too. If you have ever carried a full bag of golf clubs, balls and tees for a whole round then you know how physically taxing and time-consuming it can be. I was in that same situation for years until I made the best upgrade of my life: the Spin It GC1R Electric Golf Cart. The reason this product has been so useful for me is that it was designed for serious golfers. I have been playing for over a decade and it suits the needs of players like me who are focused on the game. It allows for fewer distractions on the course. For instance, there is a walk behind mode wherein the cart goes ahead of the player at a pre-set speed or distance. When I operate in this mode I am able to concentrate on my next shot, take into account wind and turf or simply mark down my strokes. You can customize the distance at which you want the cart to lead too. It offers 10, 20 and 30 yard lead settings. The unit itself is not a distraction from the game like other automated caddies I have seen. The modes are easy to switch in and out of. The remote, for when you are in remote control mode, is also easy to control. There are not a bunch of unnecessary bells and whistles on the Spin It GC1R which allows me to keep my head in the game. It doesn’t matter how heavy your bags are either. My bag weighs well over 35 pounds and the sturdy chassis carries it around easily. Even when loaded with heavy bags it doesn’t lose anything in the way of speed and power either as it sports dual 200 watt motors that run off of a rechargeable 12 volt SLA battery. When I am done with my round and ready to get back on the pathways I just shut her down and push it by hand and I can do that even with the power off because the wheels move freely in shutdown mode. It is a great way to save battery when your round is done. This trolley really cuts down on the time I spend dealing with the logistics of golf bags because it folds down really quickly and easily so I just toss it and my bags in the car at the end of the day. My bags don’t weigh or slow me down anymore. This is a lightweight unit compared to other automated golf cart trolleys at just 16 pounds. The Spin It GC1R Easy Trek is also priced very affordably at around $500. It features airless rubber tires so you don’t have to worry about deflated or punctured tires. The battery charges fast after the initial charge, usually taking only 5 hours to reach its max capacity. The remote control mode is very easy to get used to and maneuver. This unit can handle a maximum incline of 30 degrees. The Spin It GC1R Easy Trek is quick and easy to assemble out of the box. If you want to add a seat attachment it will cost about $49.95 from the manufacturer. There is no follow mode like some of the other electric caddies have. When the battery is running low it can be difficult to get the cart to turn in remote mode. The standard batteries are a bit heavy at 25 pounds. The Spin It GC1R Easy Trek is a straightforward automated caddy built for the serious golfer looking to get the most from his/her time on the links. I personally appreciate the simple design and bare-bones features as they allow me to stay concentrated on improving my game. While it has its share of shortcomings like the weight of the battery and issues with steering, it is well worth its weight in gold judging from the price-point alone. 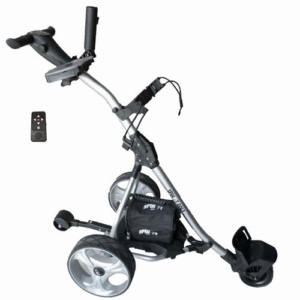 Not to mention its convenient features and ability to carry bags through steep inclines. If you are serious about your game, this is the electric golf caddy that you are going to want. If nothing else, have a look at the features and specs for yourself.